In this post I’ll consider, as much as possible through the farmers’ own words, the nature of the historical trauma they experienced under apartheid; the political – resistant – response they developed; and the forms of healing that the farm continues to offer 26 years after its founding. Hleketani Garden was founded by several dozen women in 1992, in the throes of the tumultuous transition from apartheid to democracy, and in the midst of a severe regional drought. In other writings I analyse the farm as a case study in social economy – a collaborative, grassroots enterprise with a social remit, whose purposes go far beyond material benefits to generating a community of cooperation and mutual help. These kinds of initiatives are proliferating across the globe – small, constrained, but meaningful acts of self-determination in an era of increasingly precarious livelihoods, soaring inequalities, and ecological devastation. “Back then there was enough rain, there was water in the rivers. Everyone ate from the big gardens. Children learned to plough [grow food] from their mothers and grandmothers” (Sara); “We had to cook with a big pot” to accommodate the produce of their vast gardens. “At the countryside we had space for sorghum, we had space for maize, we had space for squashes. … It was a healthy life” (Dinah). Their rural lives changed in 1970, when households were “chased” from the countryside to the lines. Formally, this enforced move was part of “rural betterment” planning, a process aimed at improving rural economies to ensure they could support and reproduce the segregated African population (e.g., through infrastructure projects like dams; conserving soils and trees). “Betterment” was infused with the belief that black people inhabited a backward and wasteful subsistence economy. Chiefs found themselves agents of policies rooted in a logic and set of priorities alien to their society, and which (as historian Peter Delius shows) “most rural residents saw as profoundly invasive and destructive.” The forced move to the lines was part of what scholar Cherryl Walker calls the “unruly multiplicity” of actual land dispossessions. The women view it as forced removal. They acknowledge certain benefits – their children would now go to school, girls included; new rules protected many kinds of trees. But the dominant memory is of a profound, collective trauma. From their vantage point nearly half a century later, the removal from the countryside was a tear in the social fabric from which their communities have not recovered. As Mphephu puts it, “They didn’t better anything. They destroyed our lives.” Across seven years of interviewing, the women consistently cite the move to the lines as the root cause of many present problems, including chronic food insecurity. And it brought home the harsh realities of apartheid: the government “started controlling us when we moved to the lines,” Sara says. Memories of removal are vivid and charged. “The government came with donkey carts, we loaded our things, they said ‘we’re showing you your land.’” These are the words of Daniel, the husband of farmer Mphephu. He was at work in a mine on the Rand when the dispossession occurred. “I’ve got nothing to say. Not one of our family remained there. I can’t find words” to express the losses – loss of land, of home, of the graves of the ancestors. The forced and inhumane nature of the move still stirs anger. “It was heavy,” he says. “We were not in control … They never consulted us. It was an order,” and it was very clear there was no recourse. “Who were you going to complain to?” he asks bitterly. “This was not happening in Jopi only; it was happening across South Africa.” Here he links the tragedy of his kin to that of the community and the nation. The women’s tones are similarly sharp in discussing these events. “There was nowhere you could go and ask,” Mijaji says. “The only thing we heard is that there’s new stands and we have to go. Women were not allowed to attend the meeting” where their indhunas (headmen) passed on the order, so they heard even less than the men. After being “chased out” (ku caciwa) of their homes, given little chance to prepare, people arrived at the lines – the village site – to find few arrangements had been made for the sudden influx. “The only thing they gave us was stand numbers,” Mphephu says. “They should have made reservoirs” and other preparations. She and others, several of whom were pregnant, remember making bricks to build houses (a task requiring fetching extra supplies of water from the river). There were long days of work in an inhospitable space; Mamayila remembers working all day to build the houses, and then cooking after dark. A particular trauma for her was losing a baby and not being able to mark his grave. In the countryside the family would plant a tree to mark the burial site of a loved one. In the village they were expected to pay for a grave marker, and she had no money to do so. She is still disturbed by not knowing where that child rests in the cemetery. A more general trauma came when the local chief, Gagesha, was imprisoned. He had resisted the removals, arguing to the homeland government that at the very least proper preparations needed to be made before his people were torn from their farms. The government locked him up and appointed his more compliant cousin as chief. “I lost everything I knew, the trees and the land,” Dinah says of the displacement. “Now the space of ploughing is very small. 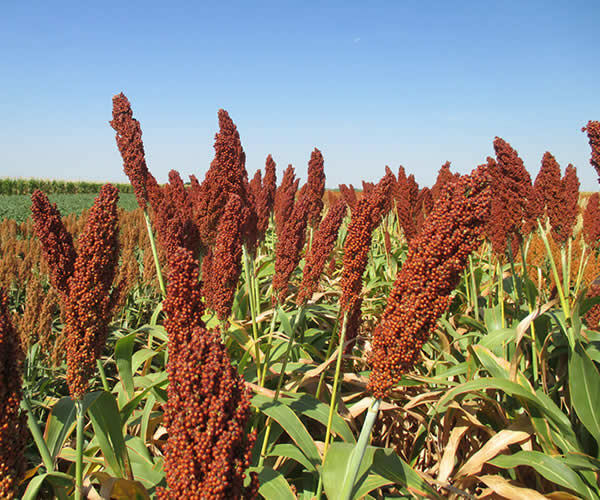 … We can’t forget sorghum,” the indigenous grain they no longer have space or labour to grow. Mamayila says it’s “very painful [va va ngopfu] to remember the way we were situated. It was so nice. You had enough land to have your garden, donkeys, cattle kraal, one side for goats, one side for pigs.” Today we have “maybe a cattle-kraal size,” says Sara. Land dispossession is at the heart of the trauma. “Pain comes in this way,” Daina explains. “This is my compound; right there the mango tree is somebody else’s compound.” Over the years the women have often conjured chickens as a metaphor for overcrowding in the village: “If my chicken tries to pass [the property line], it stirs up a fight between neighbours” (Daina); “If the chicken says it’s moving, it’s going next door” (Mphephu). As a group they settle on the phrase “you can’t find a place to spit” (ku pfumala vuphelo bya marha) as the most apt way to describe the lines. They implicate crowding in many of the health crises they face today. High blood pressure, diabetes, cancer, asthma, stroke, and circulatory problems are all called “diseases of the lines,” becoming widespread because “there is no air between us” (Sara). Josephine is curt: “the one who signed that paper” calling for the move to the lines is responsible for these diseases. These recollections shouldn’t be written off as nostalgia, nor the challenges blamed on population growth. Compounds in the betterment villages are very small, an estimated 850 square metres on average, and the arable portion smaller still. Water was a limiting factor from day one, and growing demand and neglected infrastructure make water a critical concern today. Overgrazing, erosion, and other effects of overcrowding and climate change further diminish agricultural potential. The women do not draw such a straight line between the move to the village and the crisis of HIV/AIDS; rather, HIV, for these older women, is related to cultural losses that accompanied the loss of their healthy lifestyle in the countryside. “We lost our culture and tradition when we were chased here,” Mhlava says. Daina points out that “so many cultural [practices] are not happening, because we’re sitting on top of each other” with no privacy. Elder generations used to be the main influence on children’s behaviour, including through initiation rituals; now it’s the neighbours and television, Sara complains. Then she returns to material explanations. “It’s because of hunger,” she says. Impoverished girls look for boyfriends because they hope they will give them money. Mthavini insists that what she names as a decline in morals, alongside a rise in criminality, is “happening because we are poor. Our kids aren’t working,” and the grandparents’ grants aren’t enough to meet their needs. The shift to the lines meant “all we could do was work for white farmers,” Mijaji says. “Pick tomatoes. We didn’t know that [later] the good government would come, give us a farm in our village to plant tomatoes and grow.” That grant of land and borehole well, provided by the hosi and the departments of health and agriculture in 1992 (transition era), changed their lives. “The farm makes us forget what we had in the countryside,” Mhlava says. The forgetting heals. “The farm is our hospital.” This six-hectare garden is the first place they have felt “at home” since the countryside. Mamayila puts it poetically: “Our hearts are back to teenagers. Our hands are so strong. Only our legs are painful.” She picks up a stick and acts the part of an old woman hunched over a cane: “In the morning I will have to drag myself out of bed, walk with my walking stick, and think about my home.” Several say they would be buried at the farm if given the choice, underscoring its role as home. The founding of the garden was grounded in women’s resistance to their predicament, resistance enacted through their communal tradition. “One finger cannot feed us,” they say. “We had to work together.” The strategy is driven by their determination to resist the deepening challenges of hunger, poverty, and unemployment in their households and community; and to “make something for ourselves” as women. By a number of measures, the farm has been a success. In material terms, as Daina puts it, “Our people are being saved, their lives are being saved. There is no more kwashi because of this farm.” (Kwashi, for kwashiorkor, is the local catch-all phrase for malnutrition.) In commercial terms its success has been very modest, but only the agricultural extension officer measures success in those terms. 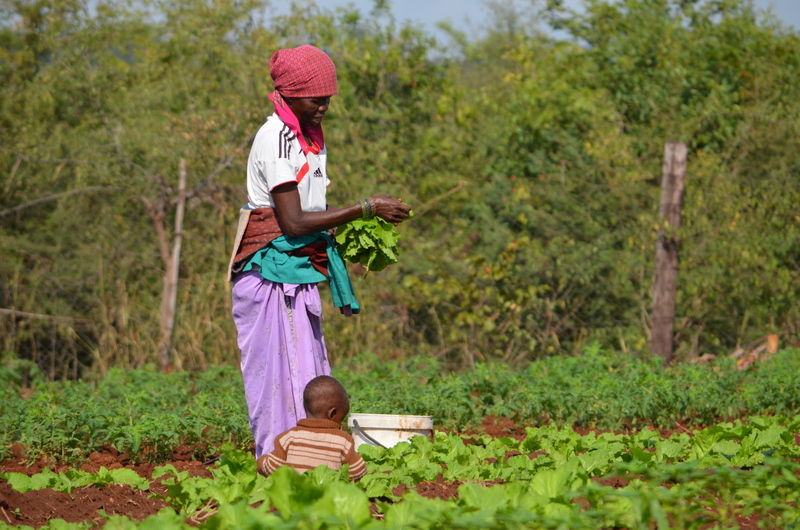 The farm’s impact on fragile household economies is substantial. Women describe how the “seconds” (blemished vegetables) they take home from the farm twice a week free up scant household income for children’s school needs, other household needs, and savings clubs. Importantly, take-home vegetables free up cash to buy water, something many households have to do two or three times a week due to the dwindling and crumbling municipal supply. 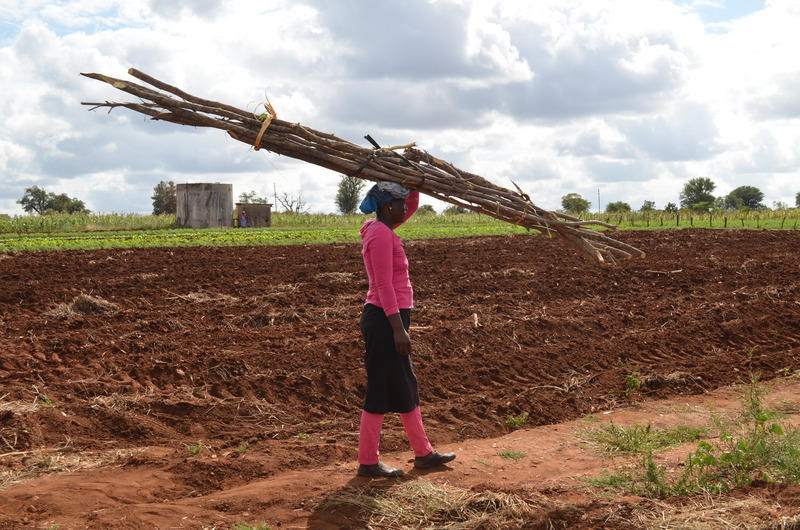 Even at the height of drought in 2015, when the farm was without irrigation after a major theft, they managed to provide their households with indigenous greens that they encouraged on the margins of the farm. 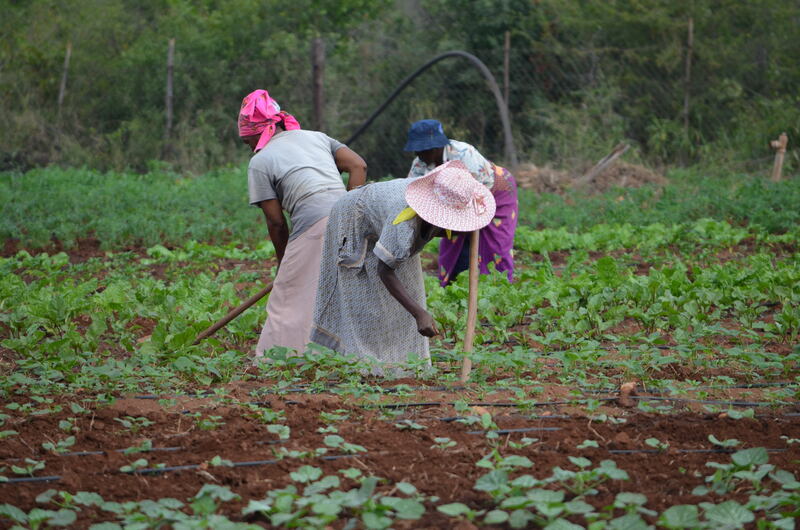 The farm enables the women to enact the communitarian ethic they revere from the countryside. They see themselves as a linchpin of the wider village community. In addition to making available nutritious, diverse, and affordable produce to a community 40 km from a supermarket, they donate their produce to families hosting funerals and to the very ill. The community is proud of “their farm,” the women say. For Florah (now retired), “[t]he reason I work here is not for the sake of [financial] benefit or the sake of my health. It’s for the community. We are supporting a very big community.” This rhetoric of community service, the gendered respectability that flows from this role, and the sense that they are able to feed the “big community” are fundamental to the women’s resilience and recovery from loss. The women have built their own empowering community inside the fenced perimeter of the garden. When they walk through the gate in the morning they enter a space of healing: a refuge from abusive husbands, out-of-work adult children, or other stresses at home. They have built community across three generations; they have secured and elaborated positive social identities for rural women, in a context where this group remains one of the constituencies most likely to live in crushing poverty. 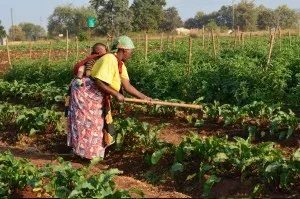 Through their daily, monthly, and seasonal activities, working side by side in the heat and dust, the women of Hleketani Garden have managed to re-inhabit the social identity of productive farmers. They are healing themselves as farmers, as women, and as reproducers of households. But always, the power of local self-determination is circumscribed. The women’s successes, inspiring as they are, mustn’t blind us to ongoing structural oppressions. Their priorities clash with, and are often subjugated to, those of an agriculture department focused on profit maximization and marketization; a local and national economy that is still shaped by the legacies of racialized land ownership, and defined by poverty and precarity; a global political economy that privileges multinational agribusiness and supermarkets as sources of food; and a development assistance economy in which the activities of women like these are barely legible. The women have laboriously carved out precious space for self determination – precious, and precarious. Delius, Peter. 2008. “Contested Terrain: Land Rights and Chiefly Power in Historical Perspective,” in Aninka Claassens and Ben Cousins, eds., Land, Power, and Custom: Controversies Generated by South Africa’s Communal Land Rights Act (Athens, OH: Ohio University Press). Harries, Patrick. 1989. “Exclusion, Classification and Internal Colonialism: The Emergence of Ethnicity Among the Tsonga-Speakers of South Africa,” in The Creation of Tribalism in Southern Africa, ed. Leroy Vail (London: James Currey). Hay, Michelle. 2014. “A Tangled Past: Land Settlement, Removals and Restitution in Letaba District, 1900 – 2013.” Journal of Southern African Studies 40 (4). Vibert, Elizabeth. 2016. “Gender, Resilience, and Resistance: South Africa’s Hleketani Garden,” Journal of Contemporary African Studies 34 (2). Walker, Cherryl. 2008. 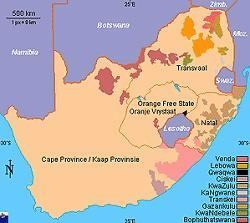 Landmarked: Land Claims and Land Restitution in South Africa (Johannesburg: Jacana). In the past seven or eight years the women have attempted to apply to many programs, from the agriculture department to the lottery, from supermarkets to small ngo’s. It’s a harrowing tale. Usually they hear of opportunities through their agricultural extension officer, who’s been supportive with advice and encouragement over the years. He brings them an application form and one of the couple of women who reads English decodes it as best she can. As Sara says ruefully, “with our high-level education we can’t do the papers.” They enlist the help of two high-school teachers who have been generous with help in the past (they’ve tried many teachers, but most look over the complicated forms and tell the women “whoa whoa – you better take this to someone else”). They proceed through the forms only to find – again and again – that they’re missing this or that required piece of information. For at least three years their efforts were stymied by the refusal of a government office in Pretoria to send the farmers their non-profit registration number. The office insisted the number had long since been sent by post (it was never received), and staff were unwilling to help the farmers further. The farmers’ experience jives with the experience of women farmers in the Global South more broadly. 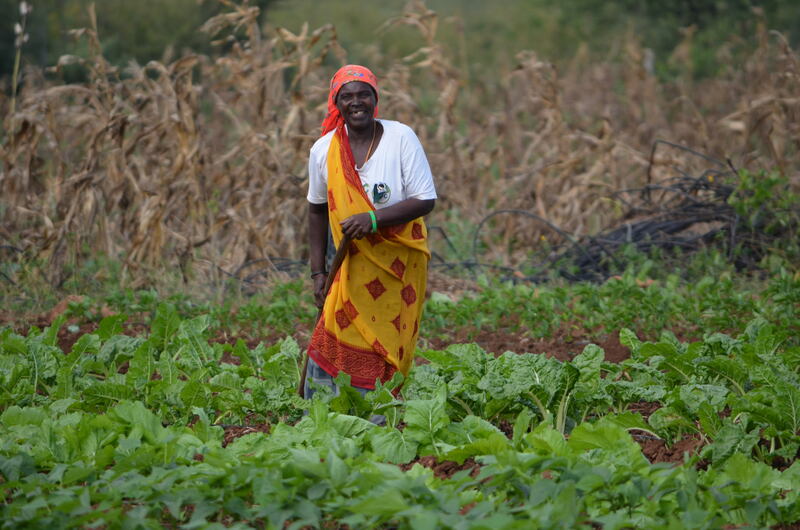 Women, with lower levels of formal education, are far less likely to successfully access farm credit than men (women get less than 10 percent of the credit aimed at small farmers in Africa); women are much less likely to own or control land; they’re less likely to have access to agricultural education and training; they have less access to labour-saving tools and other inputs; and they have more trouble mobilizing labour when it’s needed. These factors have been exacerbated by external assistance programs that long saw “commercial farmer” as a male occupation. 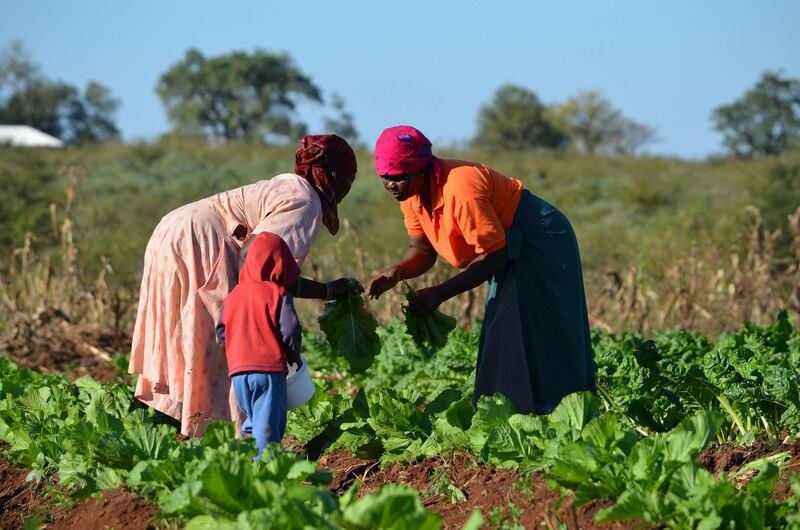 Add in their demanding roles as caregivers for children and other family members, women farmers – the majority of food producers in Africa – produce considerably less food per hectare than men. 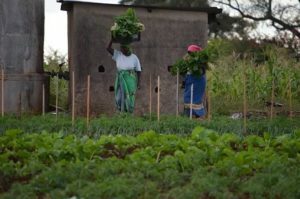 As the World Bank put it in a 2014 study, “If women worldwide had the same access to productive resources as men, they could increase yields on their farms by 20-30% and raise total agricultural output by 2.5-4%.” The Food and Agriculture Organization estimates that those gains alone could raise more than 100 million people out of hunger and undernutrition. In the Q&A following screenings of The Thinking Garden I’ve occasionally been asked “Is this farm sustainable?” The questioner usually means in economic terms, since it’s very clear from the film, and from the farm’s twenty five-year history, that it’s socially sustainable. The fact that the women can rarely afford chemical inputs and use water-conserving irrigation methods mean it’s on the sustainable end of the environmental spectrum. I understand the question. I’m open about the fact that generous folks from back home have donated to Hleketani garden a number of times since I started talking and writing about it in 2012. Could the farm run without these donations? The answer I generally give is that they were running very well – albeit close to the bone, given their community priorities – until they were hit by repeated thefts and then slammed by drought. The women date the onset of regular thefts to about 2010. These are certainly linked to deepening unemployment and poverty. Happily, theft hasn’t been an issue since a nighttime security guard was hired two years ago (one use of funds from Canada). Drought, on the other hand, is an increasingly frequent threat. Drip irrigation is the saviour here. What I haven’t said in response to the question about economic sustainability, until now, is that few farmers anywhere flourish without assistance. Farming at any scale is a risky operation. Governments recognize this fact and routinely provide credit, crop insurance, and a range of other supports. Big industrial farmers in the Global North have long enjoyed government support at levels that many view as excessive. In Canada, where farm subsidies aren’t particularly large by global standards, OECD figures show that between 1986 and 2010 subsidies to Canadian farmers varied between $6-$8 billion per year. Dairy, poultry, and egg producers are the biggest beneficiaries (with benefits tilted heavily toward the largest producers). Canadian farmers today have access to farm credit programs and various insurance programs to help them through crises like drought, pests, or spikes in the cost of inputs. Subsidies and indirect support from government accounted for, on average, 12 percent of gross farm income in Canada in 2014. It seems “economic sustainability” in agriculture is a complicated question. In wealthier countries the biggest farmers receive assistance that, for many years, seriously distorted global production and hampered market access for farmers from the Global South. Sub-Saharan African governments committed over a decade ago to allocate 10 percent of national budgets to agriculture with the aim of increasing food security and reducing poverty. So far fourteen countries have reached or exceeded the target. With exceptions (see Rwanda’s story in Sources, below), much of the increased expenditure has not reached smallholder farmers. Little has been targeted to women. Spending has focused on expensive inputs like chemical fertilizers and pesticides, or hybrid seeds bought from agribusiness companies. Small farmers often can’t afford these inputs, nor is the political will to assist them (or the agriculture sector more generally) much in evidence in countries like South Africa. Women, as noted, have a particularly hard time getting their hands on support. “It seems like they don’t want us to apply.” In the context of government neglect and increasing local risks – hotter winters, growing pest pressures, more frequent drought, deepening unemployment and poverty – small, no-strings transfers have been crucial. Unlike a lot of government and agency support, the transfers come in the form of funds the women can invest as they see fit. So far that’s meant drip irrigation, security, and the addition of two younger farmers. So far, it’s working. Tor Tolhurst et al, Are Governments of the Right Leviathan for Agriculture?